In Lebanon, there is a very low awareness on autism. We wanted to demonstrate the efforts needed to understand “autism” in a tangible and experiential way. 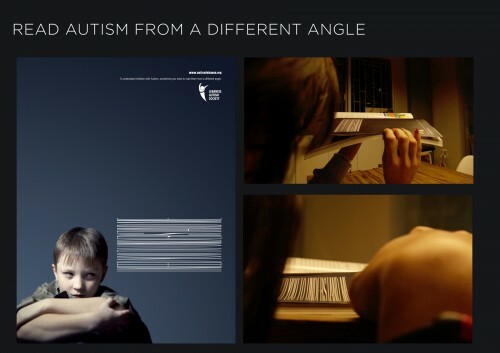 As Children with Autism never look you straight in the eyes, and are most commonly non responsive on an emotional and social level, the press ad requires readers to make the effort of looking at autism from “a different angle” using typographic distortion. This was the only way to read what was in the child’s mind. and that is exactly how to approach a child with autism – closely, calmly, and from a completely different angle.